Hazarchishma Natural Bridge in Bamyan Province, Afghanistan. Photo: Wildlife Conservation Society/Ayub Alavi (click image for larger version). 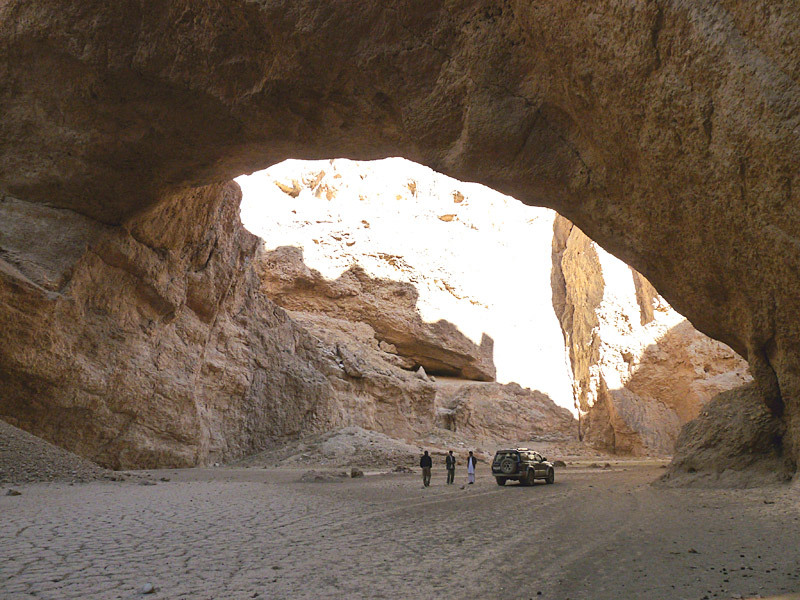 In November 2010, a Wildlife Conservation Society Afghanistan Program field survey team discovered a large natural arch in the Hindu Kush Mountains of central Afghanistan. Members of the team returned in February 2011 and measured the span of the arch, using NABS standards, at 211 feet. 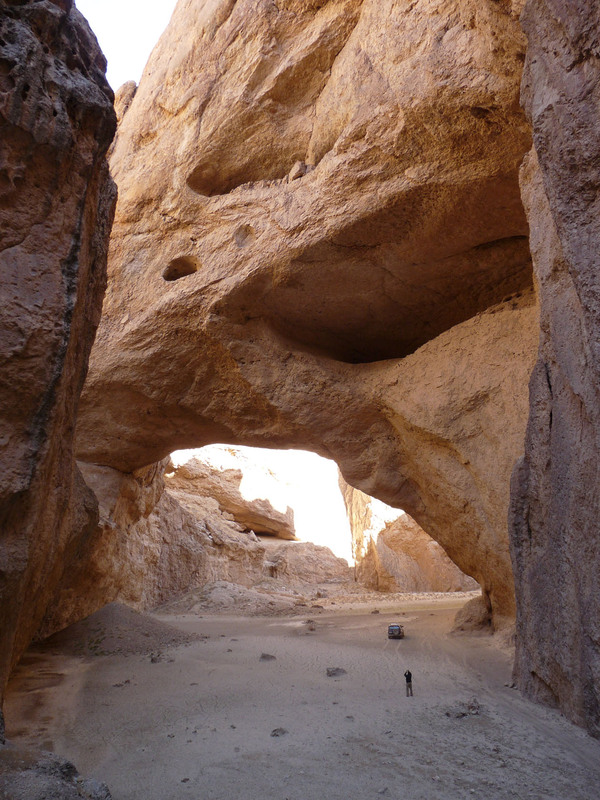 Hazarchishma Natural Bridge, western view. Photo: Wildlife Conservation Society/Ayub Alavi. 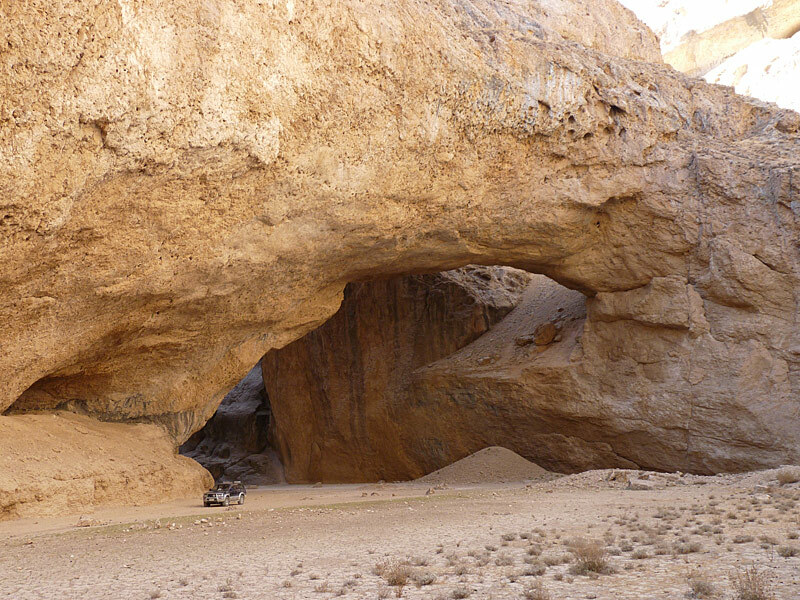 Hazarchishma Natural Bridge, eastern view. Photo: Wildlife Conservation Society/Ayub Alavi. 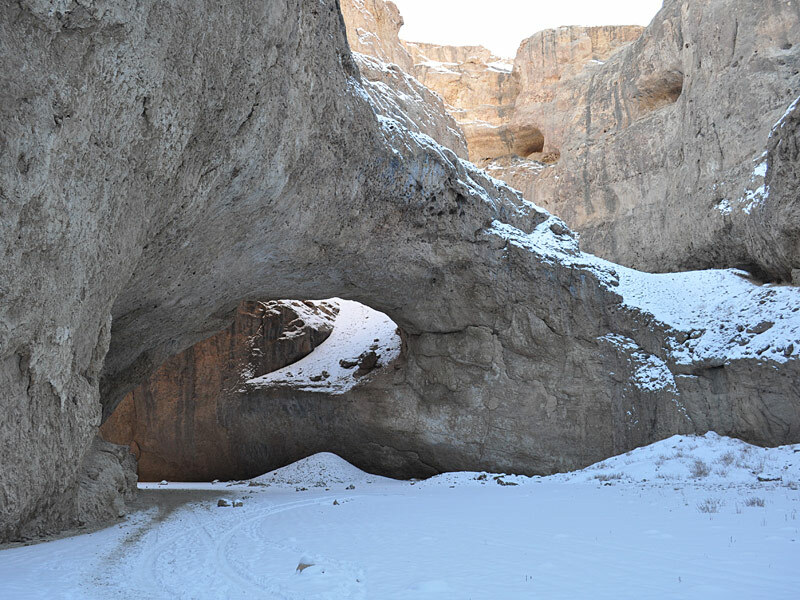 Hazarchishma Natural Bridge, eastern view in snow. Photo: Wildlife Conservation Society/Ayub Alavi. 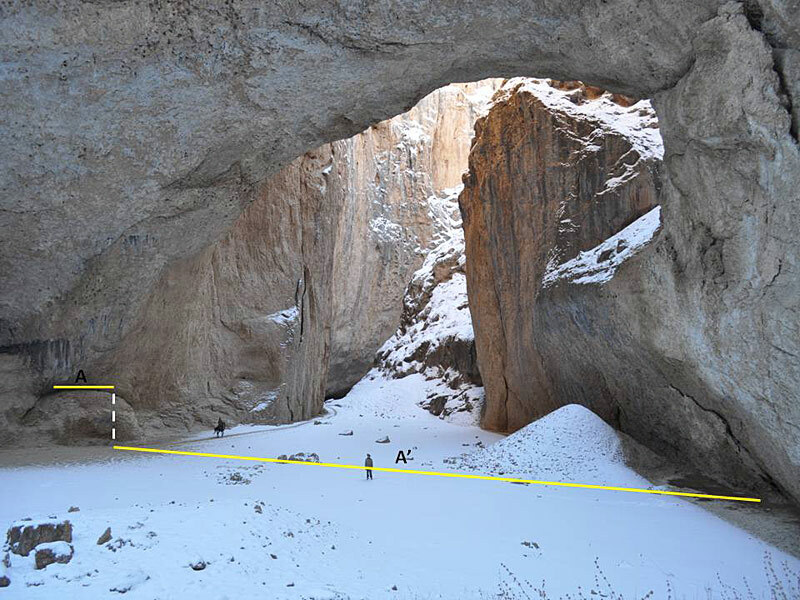 Measurement of Hazarchishma Natural Bridge. Photo: Wildlife Conservation Society/Ayub Alavi. Hazarchishma Natural Bridge is located 100 km north of Band-e-Amir National Park at the northern edge of Bamyan Province, near the border with Samangan Province. The arch is a young meander natural bridge carved through limestone karst in Jawzari Canyon (Dara-i-Jawzari), which joins the Ajar valley as part of the Amu Darya watershed and the main Caspian basin. In the recent geological past, the river became subterranean, leaving Dara-i-Jawzari dry. The elevation of the arch is 3100 meters (10,000 feet) above sea level. The Bridge is formed of massive limestone which co-exists with marl limestone shales, bituminous shales, marlstone, limestone, conglomerates, and sandstones as the over- and under-laying layers. These rock formations and layers are from the Jurassic to the Lower Eocene in the Cenozoic. The area is also of archaeological importance. The canyon below Hazarchishma village in which the natural bridge is located contains a series of caves that may have been occupied by cave-dwelling humans. This canyon lies on an ancient route between north and south and even now this route is locally used. An ancient fort was also observed during the previous field survey supporting the idea that this route must have been of some importance in earlier times. 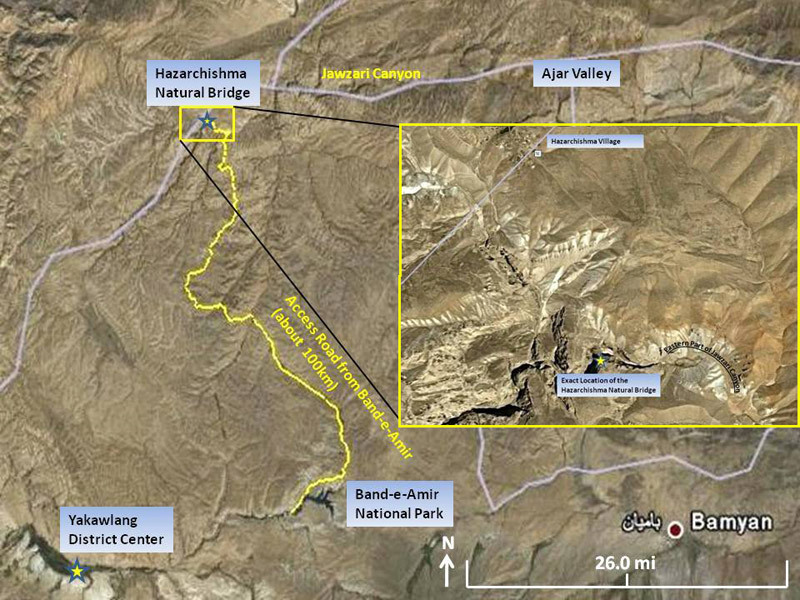 Map courtesy Wildlife Conservation Society/Ayub Alavi (click image for larger version). NABS expresses deep appreciation to Ayub Alavi, Protected Area Specialist for the Wildlife Conservation Society Afghanistan Program, for his diligence in measuring this arch and for supplying this information to NABS.